Our Teething Bling products are made from a food-safe, phthalate-free, federally-approved silicone. For more information, please contact us at info@smartmomjewelry.com. Safety-reminder: these pendants are intended for adults to wear. Please do not place the pendants ON your child. Our products were designed for adults to wear to soothe and entertain babies with emerging teeth. Children with fully developed teeth may be able to bite through Teething Bling . Therefore, parents must determine what is best for their own situation and child and as always, we remind everyone that children – of any age – should never be left unattended with jewelry of any kind. *Shipping options are based on order receipt by 12:00pm EST Monday- Friday. After 12:00pm, shipping will be handled the next business day. 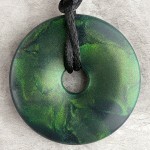 2×2 shimmery emerald green donut shaped pendant hangs on a black, silky cord with breakaway clasp.